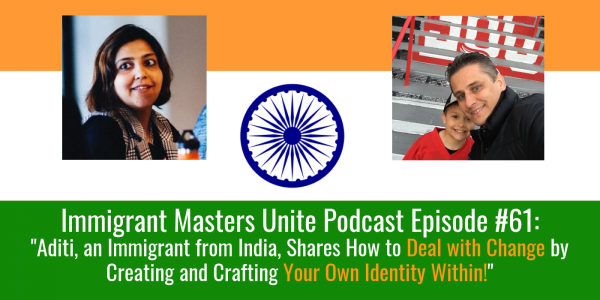 IMU 061: Aditi, an Immigrant from India, Shares How to Deal with Change by Creating and Crafting Your Own Identity Within! | Immigrant Masters Unite Podcast: Transform Your Business, Life and The World Around You! Do you feel like you’ve lost your identity and don’t know what to do? Do you know you can create your identity all over again? Do you get stuck feeling like a victim? Do you desire to gain–or regain–a mindset of powerful self esteem? This is Polish Peter and welcome to episode 61 of Immigrant Masters Unite. Today, I have Aditi Patil . Aditi Patil is an Associate Certified Coach with the International Coach Federation (ICF). Originally from Mumbai, India, she has a decade of extensive experience in Sales, Marketing and Product Management. For the last 5 years, Aditi has worked as an executive and career coach with a focus on individuals & leaders in transition. Her journey has taken her from India to Malaysia, Singapore to finally the U.S. Through these transitions, Aditi developed her passion for working with relocating women and families drawing on her own personal experience and struggles. Her “why” is to make a meaningful difference to people so they can create their own path with greater self-belief. This “Why” is at the core of her approach to individuals she coaches. Her core values of Curiosity and Compassion help her uncover stories within and around those who she works with. She currently blogs as The Marvelous Spouse ™ where she writes about her experiences as a relocating spouse, and the triumphs and trials that come with it. She recently published a children’s book, The True Story of the Ugly Duckling, which is a refreshing take on the value of self-esteem and self-belief. how to deal with the new reality and identity when you come to United States, especially when you are a woman who moves here following your husband. what is the “victim” mindset and how do we re-frame it and move towards a powerful mindset. how Thor and his hammer, the hero from the Marvel from comic books, can teach us about choice. how do you create a powerful identity that you can take anywhere. How your WHY can help you become successful in life. how you can create a powerful self esteem to lead you in life.